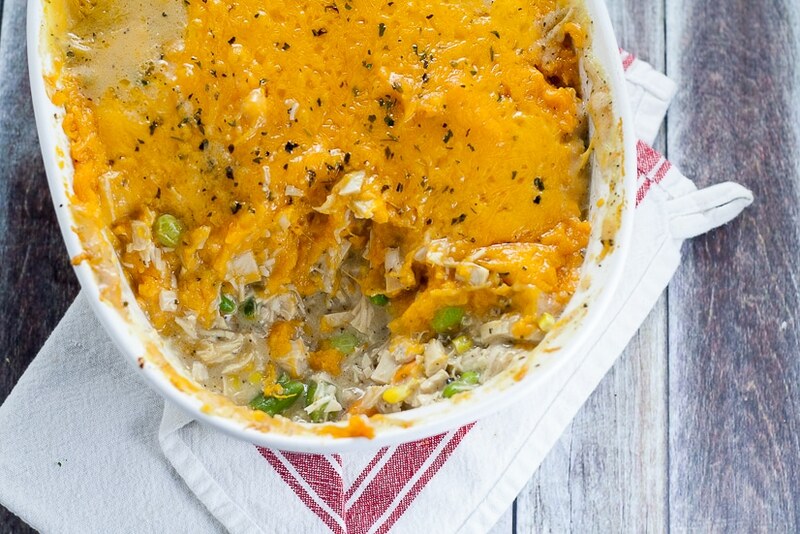 Cozy, sweet and savory, this Sweet Potato Turkey Shepherd’s Pie recipe is a great way to use up Thanksgiving leftovers in a warm delightful casserole. What to do, what to do, with all of those Thanksgiving leftovers?! My husband always teases me about cooking for an army. And that’s just a normal weeknight dinner. On holidays, all bets are off. I’m cooking for the Army, the Navy, the Air Force,… So yeah. I might go a little overboard, but I always just think that it’s better to have leftovers than to end up not having enough! Most of our leftovers get used up on turkey sandwiches for lunch, but you can only eat so many turkey sandwiches, ya know? So I have to start getting inventive, so that we don’t end up wasteful! This delicious Sweet Potato Turkey Shepherd’s Pie recipe is one of my better inventions (I won’t share my less than stellar ideas with you….). It’s a combination of a couple of favorite recipes. 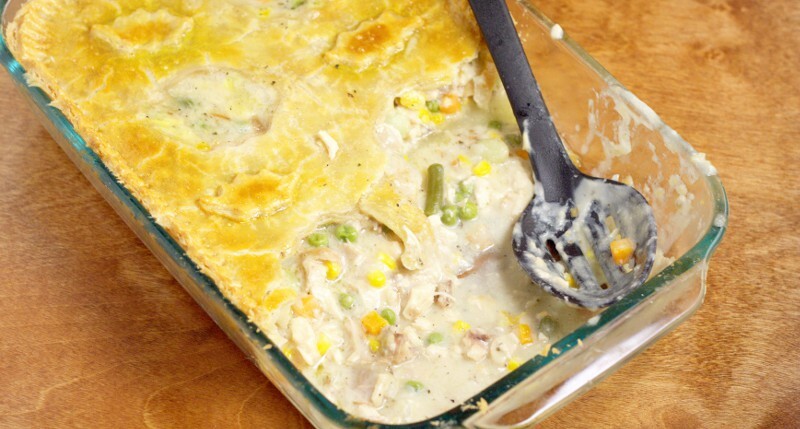 Chicken pot pie (and I also have an amazing recipe for turkey pot pie if you need more ways to use up that turkey) and my chicken shepherd’s pie. Both super yummy. 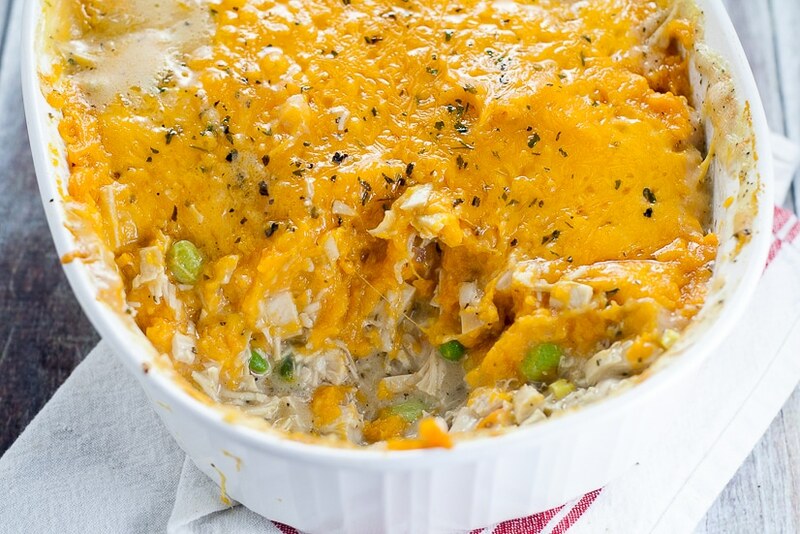 Now, I absolutely loved this sweet potato turkey shepherd’s pie with the maple mashed sweet potatoes, but if you happen to have tons of regular mashed potatoes leftover that will work here too. That’s the best part of these “dump” casserole-type recipes. Anything goes! What creative ways do you use up your leftover turkey? 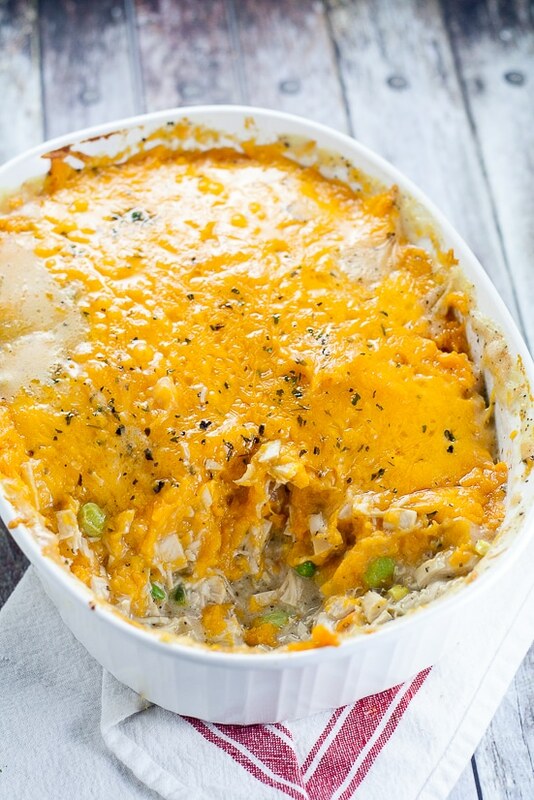 Cozy, sweet and savory, this Sweet Potato Turkey Shepherd's Pie recipe is a great way to use up Thanksgiving leftovers in a warm delightful casserole. Stir in flour and allow to cook an additional minute or 2, until the mixture turns golden and is nice and hot. Slowly add stock, a little at a time, stirring between each addition until mixture is smooth. Stir in milk until fully incorporated. Add seasonings to filling mixture and stir to combine. Continue cooking on medium heat, uncovered until sauce thickens. You should be stirring frequently to make sure it doesn't stick to the bottom. When sauce is thickened to the consistency of a medium-thick gravy, add turkey and mixed vegetables, and stir to combine. Allow filling to heat back up. Then remove from heat and set aside. In a large mixing bowl, mash sweet potatoes with a potato masher. Add maple syrup and butter, and continue mashing. Add milk to sweet potatoes, starting with just 1/4 cup and continue mashing potatoes to combine. If potatoes are still too thick for your liking, add an additional 1/4 cup milk, until it reaches your desired consistency. 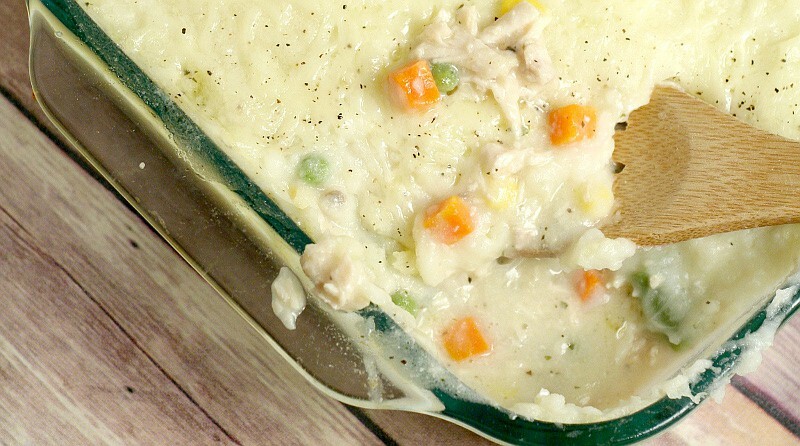 Pour the turkey filling mixture into a large 2 quart baking dish or large oven-safe skillet. Gently pour mashed sweet potatoes on top of filling and spread evenly on top. Sprinkle shredded cheese on top of mashed sweet potatoes. Bake in a 375° oven for 15-20 minutes until dish is heated through and cheese is melted and bubbly. Let set 10-15 minutes before serving. Serve warm. 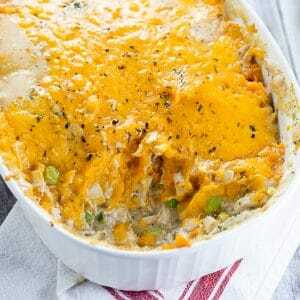 Did you like this Sweet Potato Turkey Shepherd’s Pie recipe? Find more on my Dinner Ideas and Salads & Side Dishes boards on Pinterest! 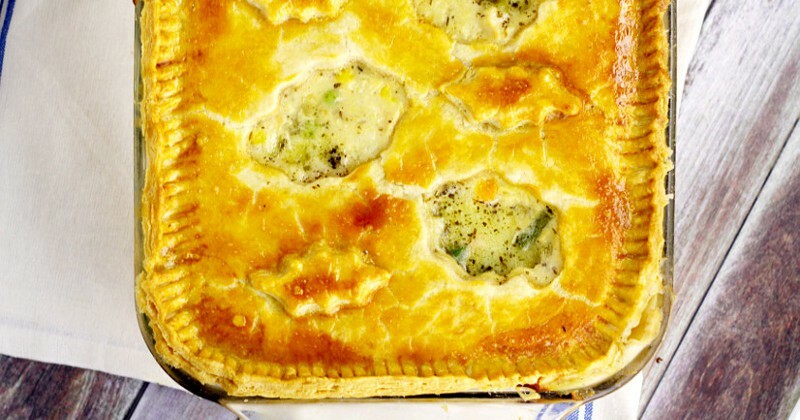 What a great twist on a traditional shepherd’s pie! I would totally make this to use those amazing Thanksgiving leftovers!